Today let’s talk about a choice that has come out of nowhere, and is now among the most defining names of the moment. 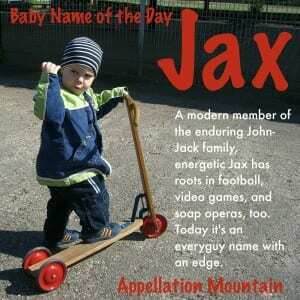 Thanks to Christina for suggesting Jax as our Baby Name of the Day. Here’s the thing about Jax: we heard the sound, ages before we bestowed it as a given name. In 1996’s indie flick Feeling Minnesota, Keanu Reeves plays a character called Jjaks. It’s a typo, and he’s not exactly an admirable character. But we were also hearing the Jacks sound in another place: the surname. It’s hard to imagine the 1980s without Michael Jackson. And then along came Percy Jackson, the hero inspired by Greek myth, who first appeared in print in 2005. They weren’t the first Jacksons, of course. Andrew Jackson was President of the United States. Michael and his brothers had hits from the 1960s onward. And it’s a common surname overall, found on the map, and also occasionally used as a given name – think of artist Jackson Pollock. 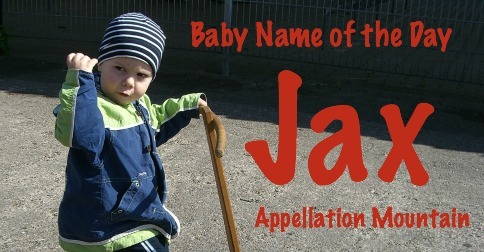 The sound of Jax is clear in the surname, but it would take more than that to make this name a hit. The Jacksonville Jaguars became an NFL expansion team in 1993, and first played in the 1995 season. that tracks with the first year that Jax appeared in the US Social Security data – it was first given to five boys in 1995. By 1996, the Jaguars had introduced their mascot, Jaxson. It wasn’t a stretch – the city’s airport code is JAX. But there’s another kind of game that may have influenced the rise of this mini name: Mortal Kombat. The long-running extreme fighting video game debuted in 1992. It was quickly followed by Mortal Kombat II, with the debut of Major Jackson Briggs as a playable character. Briggs has featured in the franchise ever since, though he’s almost always referred to by his nickname: Jax. Then there was Jasper Jacks, a character General Hospital introduced in 1996. Jasper Jacks answered to Jax – meaning that moms and dads could have discovered this name at around the same time. The pop culture innovation hit at exactly the right moment. Jack and Jackson were on the rise in the early 1990s. Jack re-entered the US Top 100 in 1996. In 1998, Jackson arrived in the Top 100 for the first time. Jack is a go-to every-guy name, for fairytale boys and grown-up action heroes, goblins and pirates and sidekicks, oh my. Jackson feels slightly Southern, a little bit preppy, and, but thanks to the singer and the artist, with an edge. Jax takes those same names and adds a rocket ship. 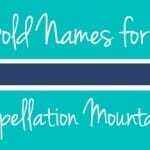 It’s all the energy of that unexpected final x, so popular in boys’ names in the early twenty-first century. Today, this family of names is among the most dominant for boys in the US. Three spellings of Jackson appear in the US Top 100. Tally them up, and it’s arguable that Jackson is the #1 name for boys in the US. Of course, Jackson and company succeed long-time top name, the Biblical John. Forms of this classic remain widely used throughout the Western world. As of 2014, Jax ranked #209 in the US. The name has gained steadily. It still has an edge – think of the character from Sons of Anarchy – but it’s also comfortably mainstream. If you grew up with kids called Jason and Mike, then Jax might feel different, a name for this generation. 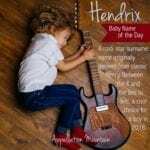 But it’s actually a powerfully popular choice today, especially when all of the boys answering to Jackson (and Jaxon and Jaxson) are considered. 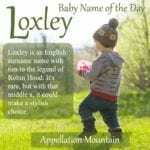 Still, it’s a modern, brisk name for a son, and one that will feel exactly on trend today. Do you think Jax is too popular? What’s your favorite Jack name?